I have no objections to fairies and enjoy thinking that might exist in some happy garden playground somewhere. They add amusement and delight to fairy tales and it's fun to imagine what such creatures would do if they existed and how they might act in particular situations. (Plus, they are just so delicately pretty!) Lucy Maud Montgomery certainly delighted in the concept of them as talk of them are scattered throughout her work. 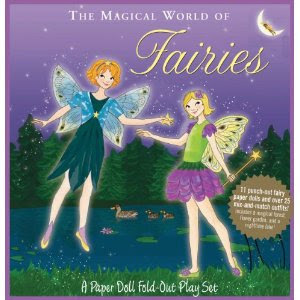 When I saw that Peter Pauper Press had a new fairy paper doll set out, well, you know I had to have a look! "Have you ever wished you could fly through a forest, frolic through a flower garden, or skip from lily pad to lily pad on a moonlit lake? Now you can!" Don't make fun of me. I like it! :) Makes me wish I were four or five and could play with them myself without my sanity being called into question. These are definitely quality paper dolls that should hold up to little hands quite well. They are printed on heavy cardstock and can all be stored inside this nice hardbound book case which includes a large attached envelope to keep your fairies and their fairyland safe when not in play. Love this set by Peter Pauper Press and love them for sending it to me to check out! Thanks! I believe that was E's response to seeing the book cover! I agree. I think Laura Ingalls Wilder liked fairies too. I like the idea of them -- and these paper dolls look fun! When I was little they had something called color forms -- the closest I got to paper dolls. It was like paper dolls, but with stickers. I have definitely stepped back into my childhood with my little girl. I am quite sure she would love these fairy paper dolls. Thanks for the review! Ellie hasn't really gotten into fairies. She's more interested in princesses right now.